It has been just over a year since Guy Fieri hopped in his red Camaro and traveled to Falmouth. Now with the busy summer season kicking off, we suggest a revisit of Diners, Drive ins, and Dives trip to Falmouth, Massachusetts. “Triple D”, as the show is affectionately known is a travel food show. The host is celebrity chef Guy Fieri who travels all over the country to explore the delicious hot spots where the locals go. Last May Falmouth was bussing and excited awaiting Guy’s rumored visit. Guy and his film crew picked 4 restaurants in Falmouth for his TV show. The next stop on the Falmouth Food tour was just down the street from Pickle Jar. 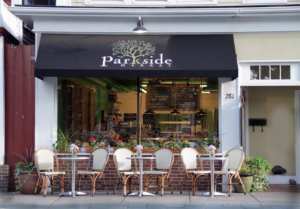 This second stop is also a breakfast and lunch joint named Parkside Market. 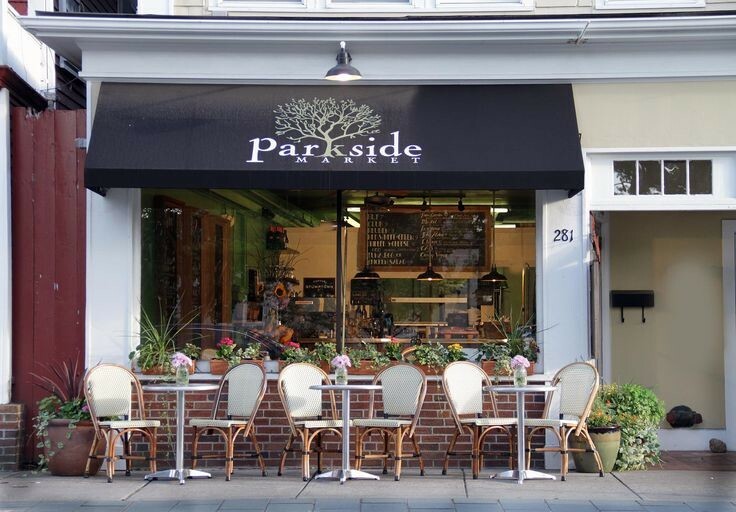 Parkside is the sister restaurant to Waterside Market located across the water on Martha’s Vineyard island. Guy really seemed to love their Tex Mex breakfast plate. The Tex Mex includes 2 eggs over sweet corn cakes, house pico, black bean hummus and avocado. If you are going there for lunch, I suggest you try the highlighted sandwich, the CAB- chicken, avocado, bacon, melted cheddar, and ranch on fresh baked ciabatta bread. To this day I’m still not sure if it is pronounced C-A-B or just the word CAB, but either way it is one of my favorite sandwiches in Falmouth ! Guy picked one of our favorite lunch spots that we recommend to our guests, The Pickle Jar Kitchen. The PJK is just a couple minute walk down to Falmouth Village from our inn They have been offering breakfast and lunch since 2013 for both the on and off season. If you want breakfast it is important to get their before 11 am when they switch and only offer their equally delicious lunch menu. Guy focused on the famous fried pickle chips, and the open face BBQ pulled pork on a fresh cheddar scallion scone. Yum ! Just last month two of our guests did a day trip with an overnight stay specifically for the pickle chips! For the folks who come to Cape Cod for the Lobster, Guy took Diners, Drive ins, and Dives down the street to Woods Hole. While there they visited a local favorite, Shuckers World Famous Raw Bar. Owner Kevin Murphy showed Guy how he makes the lobster baked cod entrée. Guy was definitely impressed with the light and fresh taste of the local seafood. In addition, the segment highlighted the experience that comes with lunch or dinner at Shuckers. That experience is enjoying classic Cape Cod Cuisine with views of the water that can’t be beat. Last but not least, Triple D traveled off the beaten path in Falmouth to a local favorite, Dana’s Kitchen. This family run spot offers homemade sweet and savory dishes created by Dana, and her husband Art. Dana and Art met at The Culinary Institute of America. Guy got a taste of two lunch favorites, the Portuguese kale soup and their signature soft shell crab sandwich, he seemed to be very pleased with both ! In recent years, the impact of travel food shows has been huge. These shows give travelers the inside scoop on the food scene of their destination before they even get in a car or on a plane. Cape Cod and more specifically Falmouth is one of the countries most popular summer destinations, so it was only a matter of time before Diners, Drive ins and Dives explored what this town has to offer foodies of all kind! The spotlight Triple D has put on Falmouth has brought guests to town just to try the dishes Guy raved about!